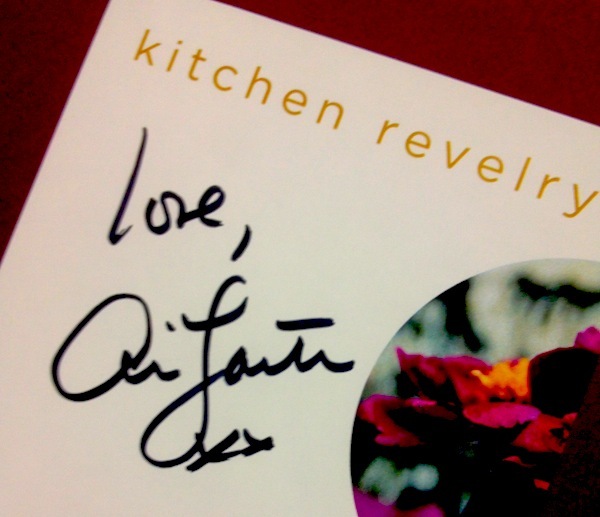 This Hardcover First Edition of Kitchen Revelry has been personally Autographed by Ali Larter. Exclusively Made Available at PremiereCollectibles.com. Ali Larter is a busy actress, well known for her roles on NBC show Heroes and in movies such as Varsity Blues and Legally Blonde. But when not on set, she is usually throwing a dinner party or entertaining at home. In fact, Ali has been cooking and entertaining all her life, and in an instant, she can whip together a wonderful meal, whether it’s for a family Sunday brunch, a spontaneous Super Bowl party, or an elegant (but not stuffy) New Year’s Eve dinner. Her parties seem effortless, but it hasn't always been that easy for her. In fact, at Ali’s first dinner party, she made the common rookie mistake of putting too much pressure on herself to make things perfect. Needless to say, with hungry guests, a burned hand, a broken air conditioner, and a mouse scampering across her fourth-floor New York City walk-up, the night ended in disaster. Through the years of trial and error, Ali has learned that while looking effortless takes some effort, cooking is not about being perfect—it's about having a great time! And now she’s eager to share her passion and knowledge for cooking, collecting her favorite go-to menus into this wonderful cookbook: from her jalapeño cheddar cornbread to crab pots with lemon caper dip, lamb chop lollipops, strawberry mint cake, and for thirsty revelers, her eucalyptus gin martinis. Ali's mouthwatering recipes and inspiring party ideas are broken down by month so you can take her lead through the seasons with celebrations such as an October Harvest Party, a January Detox, and a July Americana BBQ. Brimming with charm, beautiful and intimate photos, and Ali's personal touch as a perfectly disheveled, sassy, effortless host, Kitchen Revelry will enliven and inspire your celebrations for years to come. ALI LARTER is an actress and year-round reveler. She lives in Los Angeles, where she hosts her ritual dinner parties and legendary get-togethers. Ali shares her celebrations with her husband, Hayes MacArthur; her son, Teddy; Jackpot, the shepherd; and Ella, the wheaton. For more than eighteen years, AMY NEUNSINGER’S photography has defined some of America's most influential brands, such as Martha Stewart Living, Saks Fifth Avenue, Target, and Kohl's. Amy's published books include Shabby Chic Interiors, Weeknights with Giada, Sandwiches + Twist of the Wrist, andSummertime Anytime Cookbook. Amy lives in Los Angeles with her husband and two young sons.